While we were enjoying NCAA hockey at the corner of 7th and Hamilton last weekend, the Heroes of Hamilton were in Providence for two games. 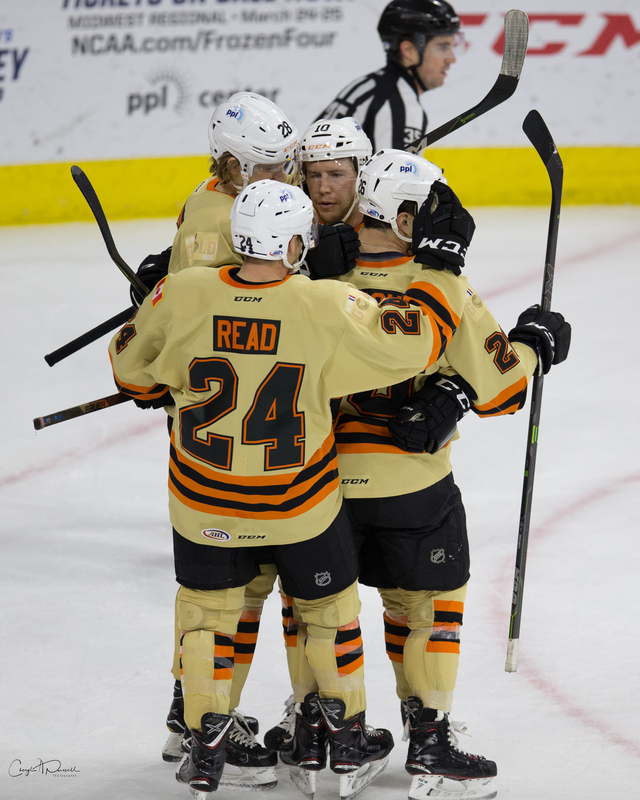 Friday night the team lost in overtime, 5-4, but coupled with a Bridgeport loss, managed to clinch a playoff spot for the second year in a row, the second time since they arrived in Allentown, and the second time in nine years. It’s not clear what happened later that night, but speculation abounds–that a little Rhode Island celebration maybe impacted their ability/desire to go back-to-back with a Bruins squad still battling for playoff status and seeding position. The 6-1 loss Saturday night was somewhat embarrassing to those of us following along at home–perhaps more-so for those who made the drive to Providence. Stolie was in the net for the debacle–making his season debut in the AHL–but I don’t think this game was an exact indicator of where he is as he returns from two knee surgeries. But playoffs-is as playoffs-does and we’re in the tournament. Now it’s down to the process of seeding, and getting our roster right for the road to the cup. And that starts tonight. 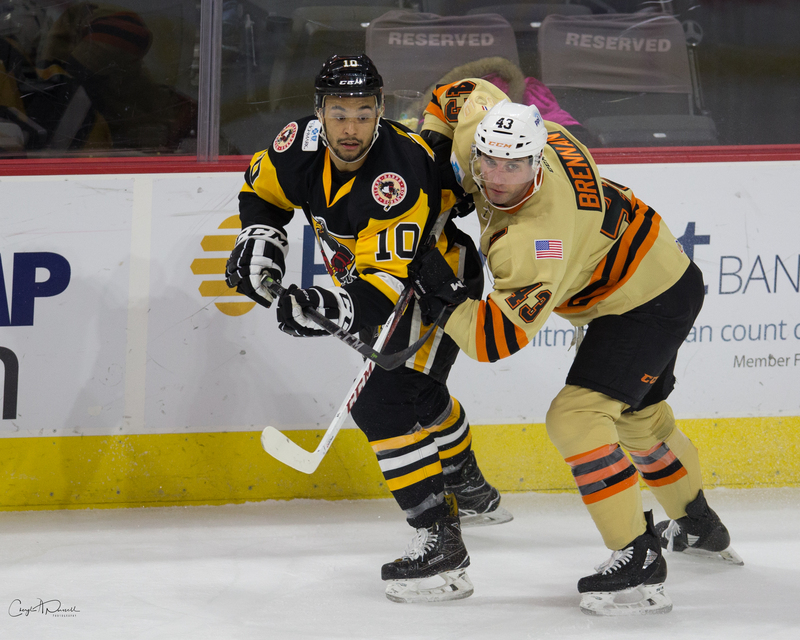 With F Oscar Lindblom still in Philadelphia, and F Matt Read never to return, Nic Aube-Kubel has been a rising star for the Phantoms. He missed both games in Providence having been suspended for another flying elbow. Methinks young Nic is trying to add some physicality to his game this season, and I’ve said all year that he looks stronger on the puck and more confident out on the ice. Still, he’s not helping us when he’s been confined to the press box by the league. He’ll be back tonight and I’m sure he’s been told to keep the elbows in a bit. Once we returned from Providence, F Steven Swavely was returned to Reading. As G Michal Neuvirth became healthy enough to return to action for the Flyers, G Alex Lyon was returned to the Phantoms. He had been recalled on “emergency basis” so unless the Flyers wanted to burn another of their limited post-deadline call-ups, then it was a necessary move. The thing is, the team was out west and Lyon never made it back to the Queen City. And Neuvirth never made it through the game. Debates began on the fan boards regarding the goalie situation with the Phantoms–fueled somewhat by yours truly. G John Muse was returned to Reading as part of this–even pitched a shut-out the other night as he’s want to do. Despite Lyon on the roster, our two goalies for tonight will likely be Dustin Tokarski and Anthony Stolarz. But out of those four guys, we’re going to need to settle on two for the playoffs. G Felix Sandstrom is in town, but not in the mix for the team, having signed his Flyers contract. He’s not eligible to play for us this season, and is still under contract in Sweden for next season unless he somehow makes the Flyers. This does allow him to come to off-season and training camp events with the Flyers. F Mike Vecchione should be ready to return after missing a week or two with an undisclosed injury. The Fly guys continue to limp along and maintain a playoff position. For our squad here in the ‘A’ it is time to rally with the guys we have and get ready for a first round without any additions. Whatever roster bolstering we might get after that, we’ll deal with it when it comes. F Danick Martel was named as Lehigh Valley’s nominee for AHL Man of the Year. D David Drake as been signed, and is with the team on an ATO contract right now after his season with UConn has concluded. The big Illinois native will wear number 39, but I doubt we’ll see him right away. 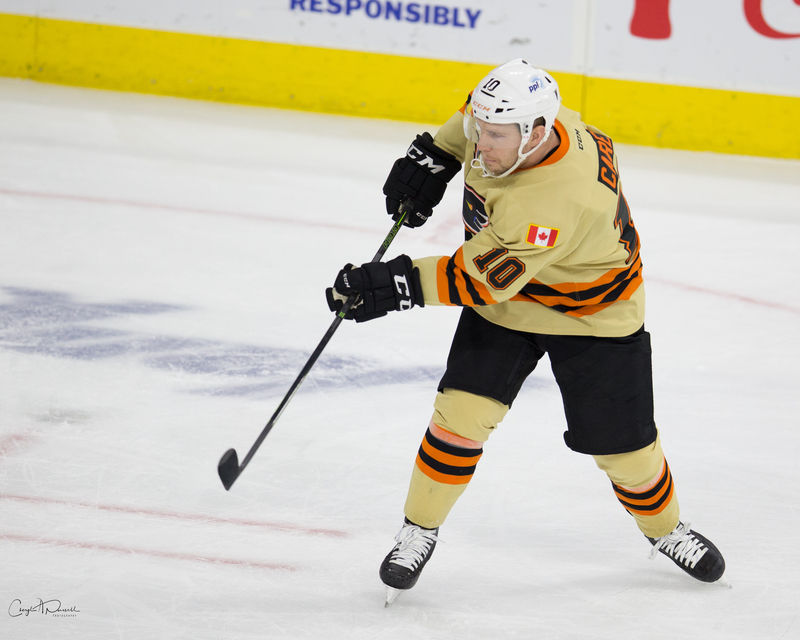 Forward Greg Carey (above) enters the week leading all Phantoms and is third among all AHLers with 28 goals scored this season. He’s now matched the 28 markers he netted a year ago. 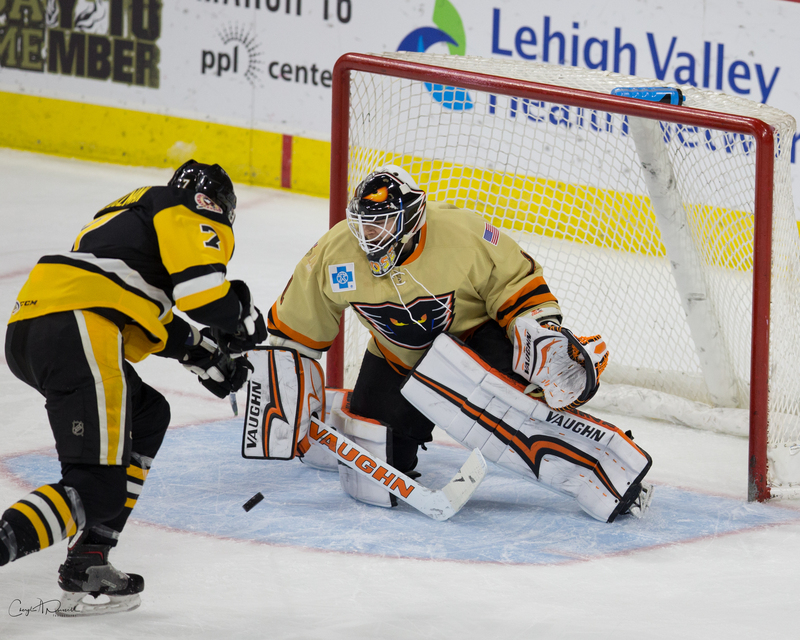 Carey enters the week having compiled 56 goals across 139 games since coming to Lehigh Valley last season. Reading is pretty comfortably in third place in the ECHL North, eyeing a first-round match-up with our old friends in Section N in Glens Falls. Manchester has clinched and is in first, and will likely see Wheeling in the first round of the Kelly Cup tournament. Wheeling has been robbed by Wilkes Barre a ton, especially in goal, and are not as formidable this season. After taking both games from us at home last weekend, Providence got bounced 5-2 on Casey Plaza vs the Penguins Wednesday night. Those two teams seem destined to play in the first round of the playoffs and continue to jockey for home ice. Providence returns again tonight as we cluster these match-ups thanks to the wisdom of the AHL schedule makers. Tonight’s event gets underway at 7:05 with puck drop around 7:15. It’s “Spring Break Night” for the high schoolers on this Good Friday. Good seats are still available. Parking tonight is free at the meters tonight, they tell me. Don’t expect the same clemency in the lots and decks on an event night, though. For the adults, there’s an “80’s Prom Party” at the Dime starting at 9PM if you’re so inclined. Of course, watch who leads the team onto the ice for warm-ups. I think I’d go with Tokarski tonight and Stolie tomorrow night, unless Neuvirth is OK and Lyon suddenly shows up. Now, if the Phantoms think that Stolarz is the best chance for us to win in the playoffs and they need to get him back in the swing, then he should be starting almost every game here down the stretch, to get ready. It’s certainly something to watch tonight because I think there’s some indication to read into it. Speed and Physicality. I’m not sure if this will have a “playoff feel” or not, but like our likely first-round foe Charlotte, this Providence team has received reinforcements and they can play both fast and physical. If we’re not up for the game it will go badly. See also: Last Saturday Night. Win or lose, though, Phantoms need to match the speed and physicality, while maintaining control and not getting suspended and whatnot. Vecchione and Aube-Kubel. Re-insert those guys in the lineup and things might be a little differently this weekend. It allows Coach Gordon to spread out the scoring over four lines a little better which creates a lot of pressure on the other team. Swimsuits and flip flops. –Nope. As much as I’m looking forward to warmer weather, it’s still a hockey arena and that means I’ll be dressed appropriately. Also, no way I’m walking around downtown Allentown with flip flops. Proper footwear because, you never know. And if indeed it is Tokarski, watch to see how fired up he is. I’ve noticed this season he seems to play better with a chip on his shoulder–and with all the goalie movement, if he feels unnoticed, he can certainly change that by hanging a low number on Providence. I wouldn’t be at all surprised. We’re back here tomorrow for Belleville on the final “color rush” day of the year. A jersey auction will follow. Also, “secret pucks” by the Phantoms Wives tomorrow. Then, the team heads down to Charlotte for back-to-back mid-week battles. In what could be a playoff preview, they’ll play down there Tuesday and Wednesday. They’ll have Friday off next weekend, then play Saturday and Sunday in Hartford and Providence respectively–with the Phan Club in attendance. After tomorrow, the Phantoms next home date is Friday, April 13.